When nothing but the best will do, the 2017 Mercedes-Benz C-Class sedans deliver. These models combine confident performance, premium features, sophisticated styling, and advanced capabilities together into a package that is quite simply a joy to drive. If you want to enhance every mile you travel in Poughkeepsie and Fishkill, you will want to be driving a C-Class sedan. Use this guide to explore your options, and get a closer look at Mercedes-Benz of Wappingers Falls. This introductory trim has an accessible MSRP of $39,500, but it certainly does not feel like a stripped down or underwhelming sedan. Under the hood is a turbocharged 2.0L four-cylinder engine that produces 241 hp and 273 lb-ft of torque. With that kind of power at your disposal, you can jump from 0-60 mph in only 6.0 seconds. There is only one significant difference between this sedan and the one described previously – with 4MATIC® all-wheel drive equipped, drivers are able to boost the performance and safety of their vehicle in significant ways. Advanced all-wheel drive makes it easier to maintain traction when conditions on the roads are wet or slick. Considering the weather in Wappingers Falls, that is a nice capability to have on hand. The MSRP of this trim starts at $41,500. What if you could maximize fuel economy without sacrificing an ounce of power? This sedan makes it possible by pairing the 2.0L four-cylinder engine with a 60 kw electric motor. Together, that powertrain boosts power ratings to 275 hp and 473 lb-ft of torque. Even better, this model can achieve up to 45 mpg city and 61 mpg combined. Those kinds of out-sized capabilities are available for an MSRP starting at just $46,050. This and all the AMG® sedans come standard with 4MATIC® all-wheel drive. This one further enhances performance by putting a twin-turbocharged 3.0L V6 engine under the hood, and produces 362 hp and 384 lb-ft of torque while lowering the 0-60 mph time to a lean 4.6 seconds. This car empowers you to race down the roads of Poughkeepsie, yet has an MSRP starting at only $52,000. If you truly want to rule the road, the twin-turbocharged 4.0L V8 engine under the hood of this model definitely gets the job done. It produces 469 hp and 479 lb-ft of torque, and sprints from 0-60 mph in only 4.0 seconds. With just the smallest tap on the gas, this sedan roars to life. The MSRP starts at $65,200. At the top of the trim ladder is a sedan that takes the 4.0L V8 engine discussed previously and refines it even further. Power is rated at a jaw-dropping 503 hp and 516 lb-ft of torque, and 0-60 mph times drop to 3.9 seconds. That makes this one of the most powerful vehicles on the roads of Fishkill right now. It could be yours for an MSRP starting at $72,800. The cabin of the 2017 Mercedes-Benz C-Class redefines what luxury can be. There is not a single surface, line, angle, or detail that has been neglected. As a result, this cabin offers peak levels of comfort, convenience, and style. Don’t be surprised if you find yourself traveling a little farther just to spend more time inside. The cabin is just as functional with spacious seating for five, and a trunk that can accommodate 12.6 cubic feet of cargo. The 2017 C-Class models are great examples of why this automaker has always been a leader in terms of design. Each trim looks bold and singular, but in a way that is sophisticated rather than shocking. 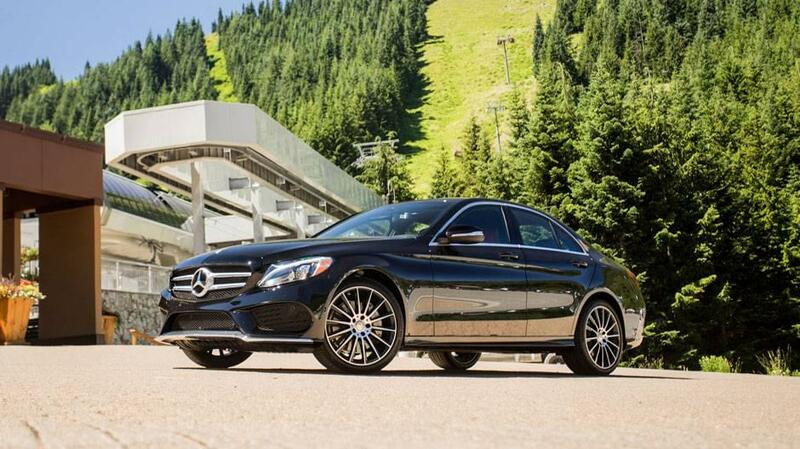 The C-Class is the kind of sedan that leads the pack rather than follows the crowd. If your goal is to drive something that looks as good as it feels, then you are perfectly matched to any one of the trims in the C-Class lineup. Head-Up Display – Reference essential information without taking your eyes off the road. Advanced Safety – A suite of advanced safety measures helps you avoid more accidents and minimize the consequences of a collision. mbrace® – Create a seamless link between your smartphone and your sedan in order to enhance the capabilities of both. Active Park Assist – Take the hassle and uncertainty out of parking with numerous driver aides and even autonomous parking capabilities. These sedans stand out from the competition, and are even more astounding when you take one for a spin. Check out the C-Class lineup at Mercedes-Benz of Wappingers Falls, and count on us to make financing easy and accessible. Reach out to us if you’d like to learn more before visiting us for a test drive.